It’s time for my Annual Performance Review! I know, I’m running a bit late this year – there’s been snow on the ground for a couple of weeks now and I cleaned up my garden eons ago. This is an entry that I ought to have done months ago, but everything kind of got away from me. Still, it’s never too late to talk about plants that worked, so here are my recommendations for the best of the annuals in my garden this past growing season. Bear in mind that my soil is the kind of compacted clay that only plastic garden gnomes truly thrive in, and I live on the Prairies, which means that it is blisteringly hot and dry during our summer days, with nighttime temperatures that plummet and hover around the freezing mark. (I exaggerate, but only slightly). My flowerbeds are primarily filled with mature perennials – I’ve been working on these beds for just over a decade now and many of the plants are nearly that old (and, sigh, some badly need divisions that I did not manage to get around to even though the weather held beautifully this autumn). I do like to throw in a few annuals every year, however, just for an extra punch of colour that lasts the full growing season…well, if the rabbits don’t get to them, that is. This year, I went heavy on the full-sized petunias – truly, they’re not my favourite plants (we sold GAHzillions of them when I worked in the garden centre years ago and now the sight of them en masse stresses me out. I have a petunia tic, I swear). But I got a super deal on some really healthy specimens and, to my surprise, they didn’t end up as rabbit fodder. ‘Picobella Red’ and ‘Pretty Grand Midnight’ did their jobs admirably well, and stood up nicely even though I didn’t water pretty much all summer and the weather was hotter than usual. Unoriginal, perhaps, but steady, reliable workhorses…which is what you need sometimes in the garden (and in life!). I only did up two containers this year – and both of them featured the same plants, the combination of which hands-down takes the award for Best Annuals. If you’re into the whole “Thriller, Spiller, Filler” thing, you’ll be disappointed, because I omitted the filler (actually, the spiller and the thriller had that job covered nicely, anyway). My goal was to showcase an amazing begonia, the ‘Pegasus’ hybrid from Proven Winners. If you’ve been following my blog for awhile now, you know I have a thing for begonias, and this one totally made my jaw drop when I uncrated it. ‘Pegasus’ isn’t grown for flowers, but for that incredible foliage. If you’re a fan of coleus (have you been growing/drooling over the Under the Sea collection from the University of Saskatchewan or are they just a little too off the wall for your tastes? 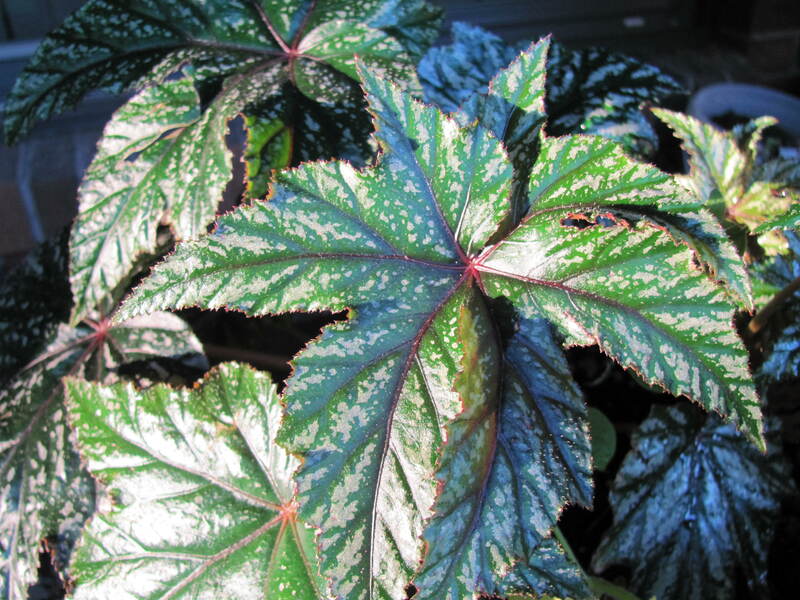 ), you’ll appreciate the sophisticated patterning on the leaves of this begonia. This is a plant that will complement any other – I’m already dreaming of new combos for next year…something in white, perhaps, that will absolutely glow in the shade? This year, I paired ‘Pegasus’ with ‘Supertunia Black Cherry’, a petunia hybrid with an attitude. These fierce beauties didn’t stop blooming even though I occasionally often forgot to water and they were located in a mostly shady spot. They even went through several light frosts, which didn’t faze the begonias, either. And that colour makes me just plain happy. 🙂 These supertunias also performed beautifully in a sunny spot well-suited to them, in the front of one of my perennial beds. 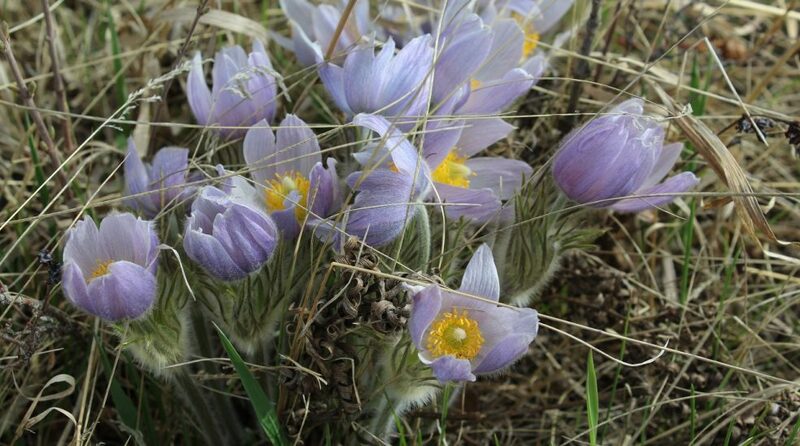 Do you grow any annual flowers? Which ones are favourites in your garden? Are there any you don’t care for at all? Finally…just for fun…do you start your annuals from seed, or do you pick them up by the flat from the garden centre? Look for ‘Pegasus’ begonia and ‘Supertunia Black Cherry’, as well as other new Proven Winner annual selections such as Salvia longisicata x farinacea ‘Playin’ The Blues’, Sutera hybrid ‘Snowstorm Blue Bubbles’ and ‘Vermillionaire’ Cuphea in garden centres in 2015. ‘Pegasus’ will be on my list, for sure! (Although Proven Winners generously provided me with a few annual plant selections from their upcoming 2015 catalogue to trial in my zone 3 garden, I was not compensated to review them. My opinions of how they performed are my own). I planted more annuals in my flowerbeds this year than I usually do: verbena in mixed jewel-like colours, hot red and orange Tagetes marigolds, and a few delicate pink snapdragons (with the notion that they would complement the handsome dark burgundy heritage ‘Black Prince’ that has been reseeding itself for the past three summers). Anyone who regularly follows my blog knows how the story of the verbena ended: the bunnies ate them (well, most of them, anyway). And the snapdragons? Well, let’s just say the little divas didn’t like the weather. Or the soil. Or something. Even the Prince, usually so reliable, forgot his lines and stalked off the stage in a huff. In the midst of all this chaos, the marigolds have managed to put on a brave, inspired performance, but really, once again, I’m questioning my ability to select annuals that don’t end up as rabbit chow AND keep on delivering. It’s not too much to ask for, is it? Well, okay, maybe…. What annuals performed best in your garden this year? 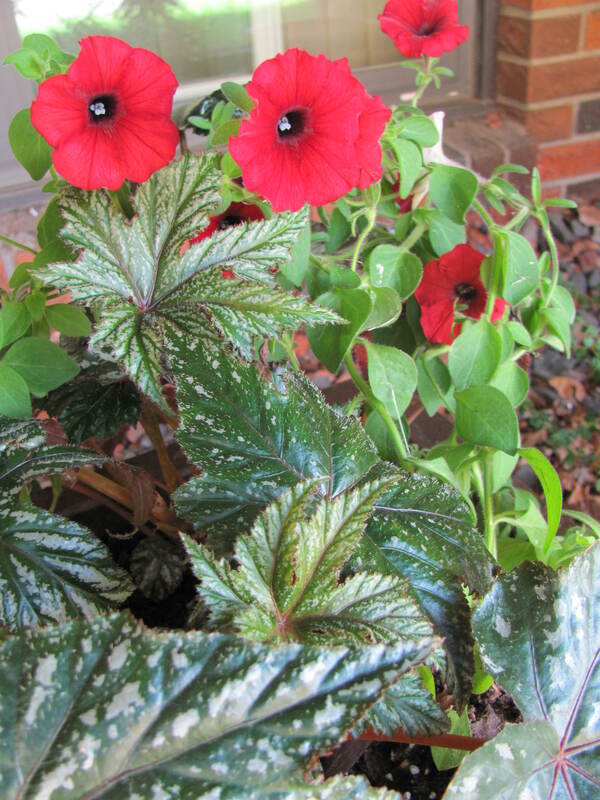 Do you grow begonias (of any type)? 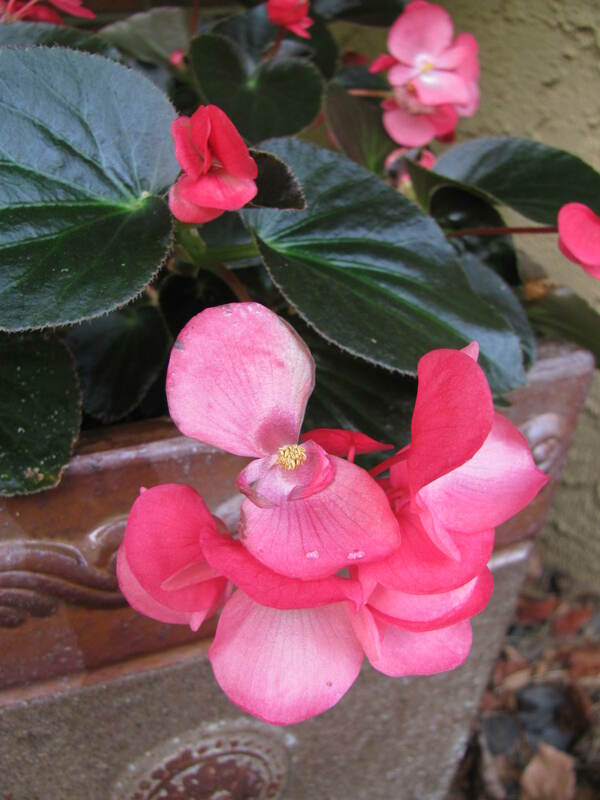 Did you make the switch from impatiens to begonias due to downy mildew concerns? (Although Proven Winners generously provided me with a few annual plant selections from their upcoming 2014 catalogue to trial in my zone 3 garden, I was not compensated to review them. My opinions of how they performed are my own). Okay, I am officially in love with this begonia. Who wouldn’t be? The hot orange blossoms + that delicious rich chocolatey-coffee foliage colour = YUM! I’ve paired ‘Mocca’ with green-leafed ‘Nonstop Orange’ in a partly-shaded location, and the two are doing fabulously! Easy-care annuals, tuberous begonias (Begonia x tuberhybrida) really only need watering (from below or with care if from above – try not to get too much water on the leaves) and a little shot of food every couple of weeks during the growing season – and they’ll perform all summer long. Although they do not like a great deal of direct light, tuberous begonias are surprisingly heat tolerant – and, indeed, get a little cranky under prolonged cool and wet conditions. Because I’m so enamoured with my new acquisitions, I’m going to try to save the tubers over winter, which I hear is a rather delicate process with varying degrees of success. I know I’m bookmarking this article, which discusses the method in some detail. 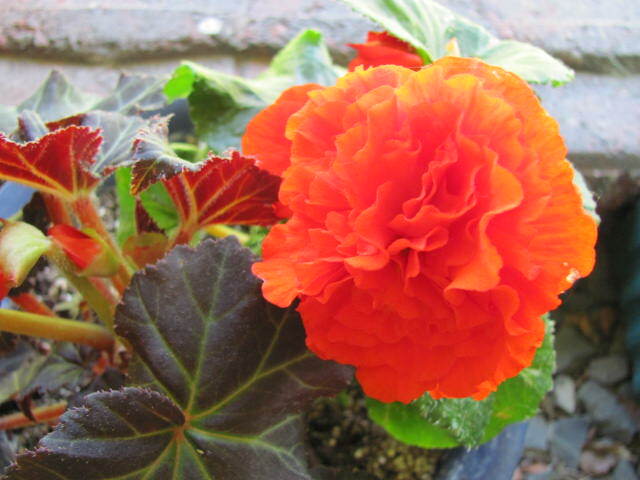 Are you growing tuberous begonias (or rhizomatous, or Rex, or any other type) in your garden? Have you ever overwintered tuberous begonias? Do you have any tips for me? Sunday spotlight: ‘White Russian’ supertunia.